One evening in 2002 I was listening to This American Life, a public radio program in the United States. A young American woman who was Jewish was talking to Ira Glass, the host, about living in Krakow, Poland. She talked about Polish interest in Jewish culture and the Jewish cultural festival, which has been hosted in Krakow since the early 1990s. This young woman said that she had mixed feelings about the interest in Jewish life and about this festival. She told him that on one hand she was happy that people in Poland were recognizing the contributions of Jews to their culture, history, and society. However, she was also slightly disturbed and even offended by it. She said she felt uncomfortable because at times she felt like she was watching outsiders reenact a romanticized version of culture that no longer existed (Glass, 2002). Her story piqued my interest. Even though I had been to Krakow several times, I had never been to the festival, partly for the reasons she had mentioned. I thought that it would feel odd going to see other people celebrating a culture that was not theirs and that no longer existed in their country. I have never been to one of the popular American Indian festivals in the United States for the same reason. I had been to Kazimierz, the former Jewish quarter in Krakow, on several occasions, and I felt that I was in a museum or in a place whose past and present did not match. Like this young woman, I felt some discomfort. I knew from reading and talking to others that most of the residents and shop and restaurant owners were not Jewish. However, Judaica and Jewish souvenirs were being sold, and there were several restaurants featuring “Jewish” food. I did finally attend the festival in 2005. I had similar mixed feelings as the young woman whose story I had heard. The unease started with the Friday Shabbat service at the Tempel Synagogue. This formerly “progressive” synagogue has a women’s balcony so that men and women could sit separately during services, women upstairs and men below in the main sanctuary. This arrangement is more in line today with traditional and Orthodox branches of Judaism, so I assume that the Friday evening service I attended was organized with the requirements of the more orthodox Jews in mind. As a modern Conservative Jewish woman, it was strange to have to sit in the women’s balcony since I am accustomed to egalitarian services in which men and women sit together and participate equally in the services. Not only was being segregated in this way strange for me, the set-up of the balcony was not comfortable. The panel on the front of the women’s balcony in Tempel Synagogue is over a meter high, so although you can hear quite well while sitting, you can see nothing of what is going on down below. To see what is happening in the main sanctuary below, one must stand and look over the rail. Therefore, during the service — and it was a religious service, not a show — there were quite a number of women in the balcony, some sitting, but most standing looking over the rail. Although I was sitting with some Jewish women from the United States, most of the people were Poles who came to see what the service was like. Think about how you would feel if you were attending mass in your church or services in your mosque and there was a group of people there as curiosity-seekers — not just to see the building, but to see what you were doing. It is a disquieting feeling. The other American women I spoke to expressed that same feeling. Not only was I participating in a service in a way that was strange to me, but I also felt as if I was part of a spectacle. 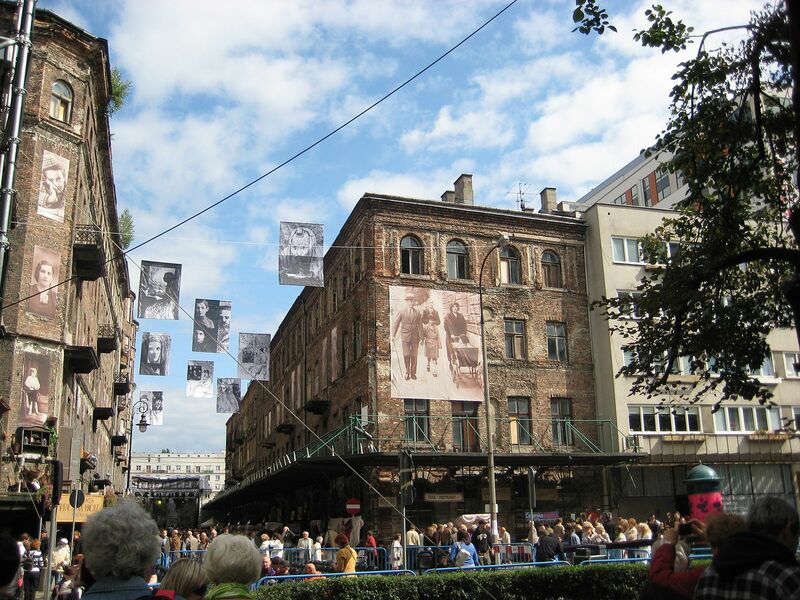 Warsaw Festival of Jewish Culture, “Singer’s Warsaw“; photo by Radeksz, 9/2/09. Click image to enlarge. Then one fall a couple of years later, I was in Warsaw during the Singer’s Warsaw (referring to Isaac Bashevis Singer) Jewish festival. Out of curiosity I went one day. There were a few vendors set up in the narrow street near the Nożyk Synagogue. Some had old items for sale, such as menorahs and kiddish cups. I was a little disturbed, just as I had been in Krakow when I had seen such items for sale. I wondered, Whose family were these stolen from? Whose family was murdered in the concentration camps so that someone could steal their family heirlooms? Equally as disturbing was seeing the pictures that a young woman had for sale. They looked like typical mass-produced pictures, but they were all stereotypical portrayals of Jewish men — old men in skullcaps with long beards counting money or holding money in their hands. I was frankly appalled by these pictures. First of all, they were portraying a stereotype of what a Jew looked like — all had big noses and sad, sagging eyes. They were also portraying the stereotype of Jews and money being connected. Nowhere was there a picture of a modern Jewish man in jeans and a T-shirt or of a Jewish woman working on her computer, only the old tired stereotype from the pre-war years. All of these experiences came together to make me ask, What is the purpose of these festivals? Who attends them? Who are they benefiting? What are they trying to achieve? So I started thinking and researching information on cultural festivals. This project has evolved since then into this much broader look at Jewish studies and Holocaust education in Poland. In 2009 I lived in Wrocław, Poland, for six months and while there took the opportunity to continue the research and to present on this theme at two conferences in Poland to largely Polish audiences. At one conference where I presented some of my research into Jewish cultural festivals in Poland, the comment about a modern image of Jews not being presented at the festivals was challenged by a fairly young Polish academic. She told me that, of course, Poles would not represent Jews as looking modern because they had never seen a modern Jew, or at least not one they would recognize as Jewish. She said there had been a Jewish boy in her class at school for a while, but he moved away. How she knew he was Jewish was unclear. However, the implication was that if a Jew does not present as Jewish — peyes (side curls), tallit (prayer shawl), kippah (yarmulke), dark hair, etc. — he (and the image is almost always Orthodox and masculine) did not fit the Polish notion of what and who a Jew is. At this same conference a young Polish woman commented on my remark about visiting Kazimierz, the former Jewish quarter in Krakow, and feeling as if I were in a museum. She said that she and her young daughter went on a visit to Krakow and went to the former Jewish quarter. She said that as they were walking around and looking at the buildings and talking about the people who used to live in this area, her daughter asked, “Why did all the people go away?” This question from her six-year-old daughter made her realize that she did not have a good answer to that question. She vaguely knew about the Holocaust, but she did not know how she could tell this child that all the people had been taken from their homes and murdered. At another conference that same year, I was talking to a young Polish-Jewish woman after my presentation. This blond-haired, blue-eyed young scholar said that being Jewish in Poland was difficult because of the stereotypes that Poles have of Jews. When people found out she was Jewish, she would often get the comment, “You don’t look Jewish,” because she did not fit the stereotype of dark hair and eyes. She said her classmates would also say things like, “Oh, I wish I were Jewish. Then I would be smart in all my subjects like you are.” She told me that she did not think being Jewish was the reason she was an excellent student, but her Polish classmates could not look beyond the stereotype of the bookish Jew. Partly as a result of these experiences and partly as a result of my role as a professor teaching about diversity and multicultural issues to education majors, I also started looking into Holocaust education, which I wanted to integrate as part of my courses. I began using an article that I translated from Polish, which had been written by a Polish secondary history teacher. He explained and reflected on why teaching about Jews and the Holocaust was so important to him and to his students. He is a regular presenter at the Jagiellonian University’s Summer Holocaust Institute for Secondary Teachers, which I attended one summer with a Polish friend. Then in summer 2011 I was invited to present there as well and spoke to a number of the participants about why they were there. In the meantime, I had also attended some talks by Polish professors who taught in Jewish studies programs and/or about the Holocaust. My interest in the topic had grown from wanting to understand more about Jewish cultural festivals in Poland to wanting to see the educational implications of what was going on in Poland in regards to Holocaust education and Jewish studies, and how Poles view this part of their history, culture, and education. Despite this growing interest in Jewish life and culture in Poland, one must realize that not everyone in Poland is eager to be reminded of the past, a fact brought to my attention when on a Tour of Five Shtetls organized during the Jewish Culture Festival in Krakow. We were at the first stop, Działoszyce, looking at the unrestored ruins of a nineteenth century synagogue. One man on the street, who was probably drunk, shouted, “This isn’t a Jewish town any more. Forget about them.” The guide knew that several of us spoke Polish and was obviously embarrassed by this outburst. She explained that many of the small towns, shtetls, where Jews lived before the war are now inhabited by Poles who relocated from other areas of Poland, and they do not have a connection to their town’s past. That may be one explanation, but it does not explain all the overt and covert expressions of anti–Semitism that still appear in Poland. All of these experiences came together for me and raised questions about what is the educational function and value of a Jewish studies program, of teaching young people about the Holocaust, of going to a cultural festival. How effective is each as an educational tool? What are they trying to teach? Are they perpetuating stereotypes or breaking them down? Who attends each and why? How does such education relate to Jewish identity? Polish identity? How does each reflect current trends in identity politics? In Holocaust education? Can these issues be the foundation for teaching about human rights in general? I realized that I could not separate the three types of educational experiences and arrive at an answer that made sense. What is taught at universities reflects current social and political issues and shapes research and scholarship. Educational reform for public education is tied to what is going on at the university and in society. Museums, NGOs (non-governmental organizations) and cultural festivals reflect local interests and the views that society has of groups of people, including minority groups. Museums and NGOs may educate formally with courses and workshops or more informally through their other programs and projects. Cultural festivals, which usually focus on the arts, represent an informal way for people to teach others about their own culture or for others to learn about a culture or a people that they may not know much about. In this volume, I bring these ideas together to examine and analyze educational experiences in this particular environment and context. After defining how I use terms such as culture, cultural marker, and stereotypes, I then briefly present the history of Jews in Poland to provide the background against which these events and experiences take place. An essay by a young Jewish-Polish man gives insight into what it is like to grow up in contemporary Poland. Next I look at education about Jewish history and culture and about the Holocaust at the secondary and university levels. Essays by Polish scholars who are active in Holocaust education and curriculum design for secondary teachers round out this section. Then I describe a few NGOs related to Jewish issues to show what is being offered through these organizations. An essay by a Polish academic gives a scholarly perspective of the role of NGOs in Holocaust education and in learning about Jewish history and culture. An examination of museums as educational institutions also offers insight into how the Holocaust and Jewish life and culture are memorialized and taught in Poland. A look at the arts and how they are used to inform and educate is followed with an essay by a Jewish-Polish woman who was musical director and conductor of the Jewish choir, Tslil, giving another view of learning through the arts. Then, I examine and compare Jewish festivals in several Polish cities to provide an overview of what they offer and how. One element of this section is identifying what these festivals do to perpetuate stereotypes and what they do to break them down. Finally, I analyze and reflect on how these elements come together to create an educational context about Jewish life in Poland, before, during, and after the Holocaust. As a young child living in the heart of Alexandria’s Black community we had friends who ran a store. They were re-settled from a Concentration Camp. I don’t remember their names. The mother had tattoos and we did not understand that. Once she let me touch it. She never told me the tales, but my father, a Black man and others, helped to build houses and create business opportunities for Jews and Blacks with the NAACP. Growing up, there were only two kind of places that would accept Blacks as patrons, Jewish Delis and Chinese eateries.At that time I was going to a mission school, ( I did not know it) paid for by the Kelly Family in Philadelphia. For a while I thought I was Irish .. and then I grew up. I taught school in Germany long ago, for several years. I read and visited places …in my struggle to understand that era of history. Most remarkable. I was returning home from South Africa, when a Jewish woman from Zimbawe sat beside me in the plane.She was hungry but they would not take her money. So I sought to get her food. Later she told me her story of being a child in the woods in Poland when they lived in the trees and waited for the trains to come. She said that they would signal the train with flashlights and that then chidden would be thrown from the train so that they would survive, to them the people living in the forest. She described how they foraged for food and what they ate.. and how careful they were to escape being found. She said they ate wild forest mushrooms, and of course animals, and soup made from anything. She held my hand while she told me this account and told me she was going to be with her sons in Florida, both doctors, as she needed to be treated for cancer. She said she was angry with the people collecting the stories of those times, but now she wished she had shared her story. Later in Washington, I went to the museum to see if this history was a part of the shadings. I did not see it. We learn from history. We learn a lot.